If you follow Professional Road Racing, you undoubtedly will be familiar with the name Kevin Buckler. Kevin is the Team Owner and CEO of the Racer’s Group. Kevin Buckler ‘s The Racer’s Group, or TRG as it is often called has quite an interesting history in Motorsports competition. I can remember back to 1995 when Kevin entered his first IMSA event at the California Grand Prix at Sears Point International Raceway in a Porsche 911. Kevin Buckler won the IMSA GTS-2 Class honors that day at Sonoma, finishing one spot ahead of Jack Lewis of Atlanta Georgia in another Porsche 911 RaceCar. I was paying very close attention to all of this because I was doing Driver Coaching and Competition Driver Development work for Jack Lewis at the time, and Jack earned IMSA’s coveted Most Improved Driver Award that year. Kevin Buckler and I had the opportunity to talk recently about his passion for Motorsports and the challenges and the demands in today’s Professional Auto Racing World. 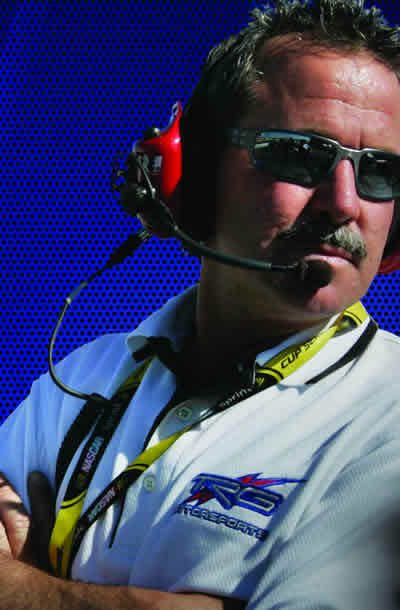 We chatted about the challenges ahead as TRG transitions further into the NASCAR world and his team’s upgraded 2010 Sprint Cup Racing Program. The beauty of the 24 Hours of Le Mans is not lost on Kevin, an event his team has won as well as other endurance road races including the 24 Hours of Daytona. As a winning team owner Kevin gives advice to others who also may have spent moments at the sidelines of the Long Beach Grand Prix and wondered just how to go about this racing thing. From Southern California to Racing in the South, here is Kevin Buckler. Derek, keep up the good work, this is really entertaining. I will pass the word around.